Members of Narragansett chapter of Trout Unlimited and Protect Rhode Island Brook Trout at RI’s Wood River. 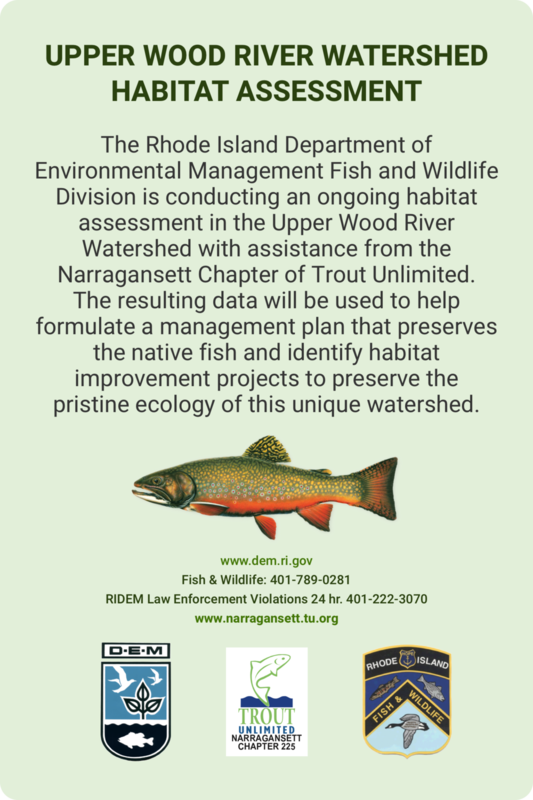 For years local trout conservationists have challenged Rhode Island Department Environmental Management (RIDEM) and Rhode Island Fish & Wildlife (RIF&W), as well as each other, as to how the Wood River should be managed. While not always pleasant, these discussions were absolutely warranted. With that said, Protect Rhode Island Brook Trout’s (PRIBT) position that the Wood River was ground-zero in the battle to save RI’s wild native brook trout was ecologically sound and absolutely defensible. And with the cat out of the bag, NFC had no choice but to side with PRIBT and regardless of who it might offend or upset. The upper Wood River is arguably RI’s best chance to save self-sustaining native brook trout. A while back I received an email from the president of Narragansett chapter of TU. This led to a phone conversation during which I reiterated that while it wouldn’t have been my choice as a place to take a stand, NFC fully supported PRIBT’s position on environmental grounds regardless of the social and political implications. I told them they were on unstable ground and that defending the current management plan, or worse, being part of it, was untenable. A few months later NFC was again approached by Glenn Place, president of Narragansett TU with some questions about possible signage for the Wood River. We discussed their goals, offered some general guidance, and told them we would do whatever we could to help to try to make it happen as we saw it as an important and long-overdue step forward . Last week Narragansett TU received three batches of new signs to be posted on the upper Wood River. Partnering with RIDEM and RIF&W, the signs address habitat, litter, and trout, including acknowledging that wild native brook trout are present in the river along with a request to help protect them through voluntary catch-and-release. But again, NFC sees this as a great and important step forward, and something that should be embraced and supported by all. Special thanks to PRIBT for pushing the envelope, jamming a foot in the door, staying in the saddle, and making people aware of this invaluable and unique resource, the challenges it faces, and what needs to be done to help it meet its potential. And likewise to Narragansett TU for moving beyond stocking, and working with the powers that be to make these signs a reality. And for being patient and staying the course as the wheels of progress ground painfully slowly forward.